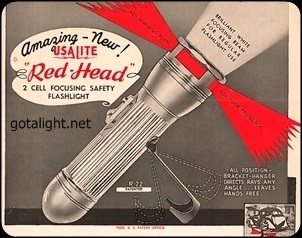 USALite RedHead flashlight gallery. There's at least 15 different model-versions of the USALite redhead flashlights. These are also know as... motorist's safety flashlights. 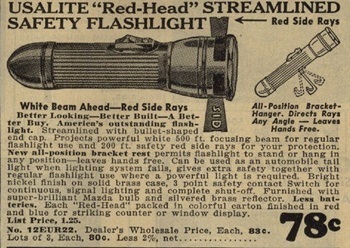 I now have all my vintage USALite RedHead flashlights on one page, along with some information on these flashlights. 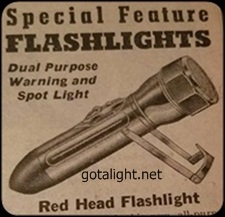 This gallery features a USALite redhead flashlight not seen by most collectors. In fact, if you've never been here before, there's maybe a couple more you haven't seen, and another version only seen in an ad, that came in different colors. You'll see I have no version numbers, on the redhead flashlights listed here. The Flashlight Museum has version numbers on their website. They also show a flare red-head without a number? I have 5 redheads not listed on their site, so I wouldn't have the version numbers for those, if there was any. Plus there are other redheads not shown on the Flashlight Museum website. The versions can be confusing anyway. I have no idea where the numbers came from, or why. Maybe that's the way they list'em on their site, or did they come from a catalog? I just care about the flashlights. The top model has the flat end cap dated 2-13-23. Redhead is not printed on the end cap. 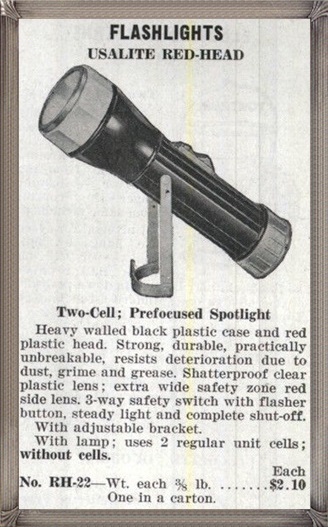 The Flashlight Museum shows the same end cap on their version #7. Below that one is the Phillips 66 redhead with the Phillips 66 logo on the end cap, (has a bulb holder in the end cap). You can see the Phillips 66 in the Show & Tell section to see the end cap close up. Also shown with it... is the flat end cap with the Phillips 66 logo. Which now means, there's two models of the Phillips 66 redhead. Here we have two that looks the same. Notice the top one says... Atlas on the name plate, not USALite. Atlas sold tires, batteries and accessories, to service stations and auto parts stores back in the 40's. It has USALite redhead printed on the end cap. Both have a ring hanger. First one I have ever seen. So I had to have it for my collection. On top is another hard to find red-head. The Red-Head Jr. motorist's safety flashlight, with the cone head. There's 3 things that makes this one real different from the others. It has an anodized gold colored body, uses 2 C cell batteries, and instead of the stand or ring hanger, it has a... belt clip on the back. More info on Junior, in the Show & Tell section. Look for the caption... Is That You Junior. Below Junior, we have a D cell model, which also has a cone shape red-head, and the slide-in ring hanger. I'm still looking for the model without the name plate, which also has a cone shape red-head. 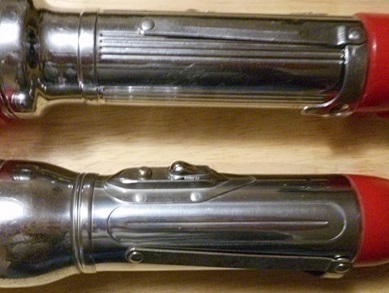 A matching pair of two hard to find 1940's USALite redheads, with and without the stand. Both have a plastic lens with USALite Redhead printed on the end cap. Both flashlights did not come with a ring hanger. These are harder to find than the metal bodies redheads, and the one without the stand doesn't come along very often. The flashlight with the stand, shows up on eBay now and then. This my latest red-head find, and it's a rare one! 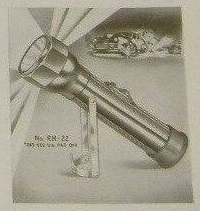 On the box it says it's a 2 in 1 flashlight, long range spotlight, and safety red side rays. It's the first one I have ever seen! Looks like version #2, but with a red bullet end cap. No metal name plate and no markings on the end cap. Also, no grooves on the body like the other versions. Even though it looks like the other models at first glance, there is a few more different details to check out. I would have no proof it was a USALite red-head without the box. The box has seen better days... but I'm just like glad the box was with the flashlight. One final note. Was this one before the others, or, after? I would say, after. On the box it says... New Improve USALite Red-Head. I'm thinking mid to late 40's. The ad you see here, has no date on it. That's what happens, when there's no cover on the catalog. What's different you ask? We can all see the bullet end cap is different. The metal head, you can adjust the beam by turning the entire metal head to the right or left. The others don't turn. The grooves on the body are different. The switch has 4 rivets, the others have 3 rivets. The red-head shown here, (came with a bulb holder for an extra bulb) has USALite redhead printed on the end cap, I have also seen another one with... Made In The United States Of America printed on the end cap. Maybe it was replaced, or not? These are the red-redheads the car guys pay big money for, (flat end cap included). So we need to get lucky and find one not listed on eBay, (like a yard sale/flea market, etc) or pay the big bucks. I've been lucky so far. I just can't see paying $500 or more, for any flashlight. But, that's just me. What did we learn? There's at least 18, maybe 19 different models of the red-heads. Which includes... the redhead with the Gamble's flat end cap, two versions of the Phillips 66, (bullet and flat end caps) two versions with the GM logo, (with and without the stand) all made by USAlite. There's also 2 another models only seen in an ad, the Red-Head Juniors. The ad says baby cells at one price, (not shown) and regular cells at another price, sounds like C & D cell batteries to me. These are different than the red-head Jr. shown here. Follow the link below and take a look. I just wanted to point this out. The lens holder has windows in at least two sizes, (where you see the red lens) as seen in the photo. Last word. I know there's other flashlight collectors out there, that don't have a website to share their collections. If anyone collects the USALite brand flashlight. Please contact me. Maybe we can share some information. If you have that hard to find one, (USALite Flashlight). I would really like to see it. Thanks. I have another USALite red-head, not shown here, yet. I know I've said it before, it's different than all the others. I will show some photos of the flashlight in parts/sections, so you can see how different it really is, and explain what's different about it. You will be surprised. 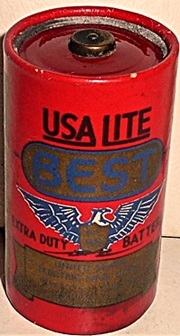 The top USALite battery has Oct. 28 1923 printed on the label. The Best battery has no date, also made by USALite. Below that one, another Best battery, which also has USALite on the label. These are the paper label types. The Best brand battery was properly sold with the Best flashlight. The Best flashlight is shown in another gallery. Now I'm wondering... if USALite/U.S. Electric Mfg. Corp. made batteries for another off brand flashlight, the Marathon flashlight, (also shown in another gallery). Only time will tell.